Happy New Year! If you're like many folks this time of year, you're looking to make changes in your life for the better. Maybe you've thought about setting up a worm farm for extra income or as a career change. These are just come of the main reasons people want to raise earthworms. And your worm farm setup depends on your specific reason or reasons for starting a worm farm. If you're starting a worm farm for purely personal use or for ecological reasons, your setup won't need much room, can be simple. Vermi-composting (composting with worms) household and yard waste can be nothing more elaborate than heaps and bins where ever there's room. There's no need to purchase those expensive stacking trays, either. Those ridiculous spigots on the bottom to catch "worm tea" are useless. If your worm trays are wet enough to produce water out that spigot, your worms are dead, dying, or gone. Simple opaque rubs with or without lids, appropriate worm bedding, lights overhead, and non-chlorine water does the trick. Simply chop food stuffs fine, add to the top of the bedding and cover with dampened cardboard, shredded paper, or newspaper and provide an overhead light (to prevent crawling). Harvest out overcrowded worms and start new bins or give to neighbors or put into your yard or garden. Or, start new beds if you have enough organic material. Starting a commercial worm farm for profit requires somewhat more planning and setup. Space required is of course dependent on how large you want your worm farm business to be. If you're new to worm farming, I suggest you start small, get the hang of it, then expand your worm beds as your expertise and market increases. It's surprising how little startup money, space, and time it takes to get a worm farm set up and earning extra income. In no time (6 months to one year), you can be making a sizable income for you and your family. Worm farming is one of the easiest home-based business to start, with the least amount of money invested, with the quickest profit return. However, there is a certain amount of knowledge required in order to save money, time and aggravation - knowledge that you absolutely have to have in order to be successful and earn money. The difference between those who fail at worm farming and those that create a successful home based business is specialized knowledge about growing, breeding, and marketing earthworms. In order to help my worm customers who want to start their own worm farm, I put this specialized knowledge I've acquired through the years into a manual form. This manual gives them step-by- step procedures in the order that's required as they begin their worm farm business. It's saved me time as well, since I don't have to spend hours on the phone going over instructions and problems! 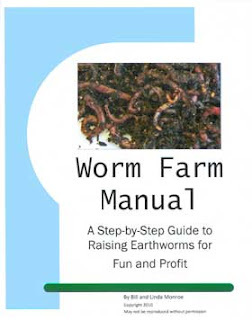 If you are also considering setting up your own worm farm, you'll find my worm farm manual a helpful guide to follow. It's available in a handy download version and also in hard copy format. Here is more information of what you'll find in the manual. Or click on the link below to order.